Half a century later it still works! My senior year in college I had an apartment where I had a kitchen and I could cook my own meals for the first time. Graham Kerr had a TV show called the Galloping Gourmet. He drank a lot of wine (akin to Julia Child), and I thought he was pretty cool. On top of that it seemed as though being a chef, understanding food, drinking good wine, and being a classy entertainer would be an impressive skill. So I got kitchen stuff. 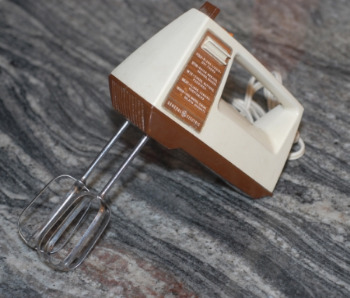 One of the kitchen utensils that I purchased was this mixer. I used it to mash potatoes and make waffles on Sunday morning. That was almost 50 years ago! Now admittedly I haven't been doing a lot of cooking for the last thirty years or so because I married a wonderful woman who loves to cook and does it far better than I could ever do it and Graham Kerr is no longer on TV and I probably wouldn't watch him anyway. The impressive thing is that this mixer is still working! Still being used! And really doesn't look all that bad for a design that is half a century old. I'm not sure that the designer and manufacturer ever thought it would last this long, but the fact is that it has! Cell phones and computers and just about everything else gets replaced constantly. It used to be just cars that people replaced every year. I used to believe that if I bought the best of something I could keep if for a lifetime. I have my father's watch from his marriage in 1944. I have my grandfather's watch from even before that. Now, watch batteries die! It's hard to buy and heirloom watch. So what is there to which to attach your message of undying love? What object can you offer that will be admired through the coming years? An expensive watch from Apple or Samsung or I-Gucci will go dark sometime. Maybe we should engrave a mixer with "Love Eternal - 2016"!